Steven Matz has been awful since returning from the disabled list, and the Dodgers have the second highest tAV in baseball. The Dodgers have also hit three or more home runs in all six games they’ve played against the Mets, unsurprisingly winning all of those games. Tough to imagine a worse matchup for Matz as he desperately tries to get his career back on track. The game seemed to start smoothly for Matz. He struck out Chris Taylor and worked around a walk to Corey Seager to hold the Dodgers off, or so it seemed. A caught stealing call against Justin Turner was overturned, and Matz followed that up by giving up a walk, a double steal, a two RBI bleeder up the middle, an RBI double, and finally another single on which Michael Conforto threw out Austin Barnes at home plate with the help of a fantastic tag from Travis d’Arnaud. The best team in baseball took advantage of Matz’s total inability to hold runners on along with his continually flat breaking stuff, and established a 3-0 lead before the Mets even came to bat. 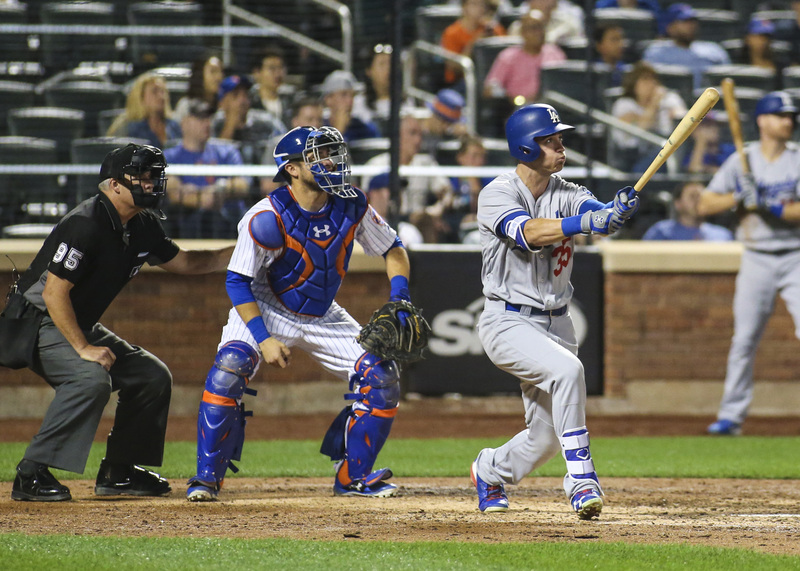 Matz bounced back with a clean second, but the Dodgers were back to mashing in the third. Corey Seager singled on a soft ground ball that Wilmer Flores broke the wrong way on at first base (good lord is the Mets’ infield defense terrible), and Justin Turner followed that up with a two-run home run to right field to extend the Dodger lead to 5-0. In unexpected but very welcome turn, Matz was actually fantastic for the rest of the night. Matz allowed only one walk after the Turner home run, striking out five over the next 3.1 innings. He seemed sharper, keeping the ball lower in the strike zone and inducing more swings and misses then we’ve seen just about all season. His high pitch count from the first three innings forced Matz out after 5.1 innings, but he struck out seven in what was an encouraging outing, all things considered. It’s a bit sad that the bar has sunk this low, but that’s the 2017 Mets for you. Erik Goeddel relieved Matz and finished out a scoreless sixth. Hansel Robles followed that with a shut out inning in the seventh. Things didn’t go as well for Josh Smoker in the eighth, when Cody Bellinger hit an absolutely stupendous home run out to center field. Conforto hardly moved on one of the loudest home runs I’ve seen in a Met game this season, and the Dodger lead was stretched to 7-0. The Met offense, meanwhile, managed next to nothing against Dodger starter Hyun-Jin Ryu,who needed only 96 pitches to toss seven shutout innings. The Mets managed only one hit, a single off the bat of d’Arnaud in the third. There was certainly some hard contact in the later innings, but most of the Mets’ at-bats were off balance and flailing. Ryu dominated with eight strikeouts and no walks. Tony Cingrani pitched a 1-2-3 inning for the Dodgers in the eighth, and they added an eighth run in the top of the ninth on a triple from Chris Taylor off of A.J. Ramos. Ramos struck out three in the inning but walked two, a pretty good snapshot of the kind of pitcher he is. Kenley Jansen entered for the ninth and closed out the season sweep for the Dodgers, working around a walk to Brandon Nimmo and striking out the side. With the 8-0 loss, the Mets maintain their spot at seventh in the reverse standings at 49-60. It’s the worst record they’ve had since 2014. It’s another short recap because frankly, the Dodger’s dominance of the Mets is boring at this point. Ho-hum, another ten pitch at-bat. Ho-hum, another long home run. Ho-hum, another 1-2-3 inning where every Met batter looked totally lost. There’s no drama and no contest, because the Dodgers are incredible and the Mets are….something else. If you want to be a little bit more depressed, think about a team that has a healthy David Wright and the now elite offensive presence of Justin Turner and Daniel Murphy on the infield. Even with the pitching injuries suffered this season, that team is probably fighting for a wild card spot at least, and has a much better outlook for the next couple years. It’s okay to cry a little bit more at that thought. Hansel Robles had an MRI, but the Mets found no structural damage (stop me if you’ve heard that line before). He tossed a scoreless inning Sunday night, but seemed to lose control of two fastballs that sailed up and in. It’s also possible Robles was trying to send some sort of message to Yasiel Puig for some stupid reason, but assuming that’s not the case, the continued inability to prevent those kind of misses is concerning. In more trivial news, Noah Syndergaard appeared in last night’s episode of Game of Thrones. Without spoiling anything, Thor didn’t meet a very pleasant end.